If the vehicle can still drive, move it off to the side of the road into a safe location. This can include a parking lot, the shoulder of the road, or any area out of the line of traffic. If the car cannot be moved, turn on your hazard lights to alert drivers you are not able to move anywhere. If you are not seriously injured and can safely move, turn off the vehicle, take a big, deep breath, do a quick inspection of the vehicle to make sure it is safe to exit, and get out. If you have safety signage or flairs, remove them from the car and place them in way to alert other drivers of the accident. 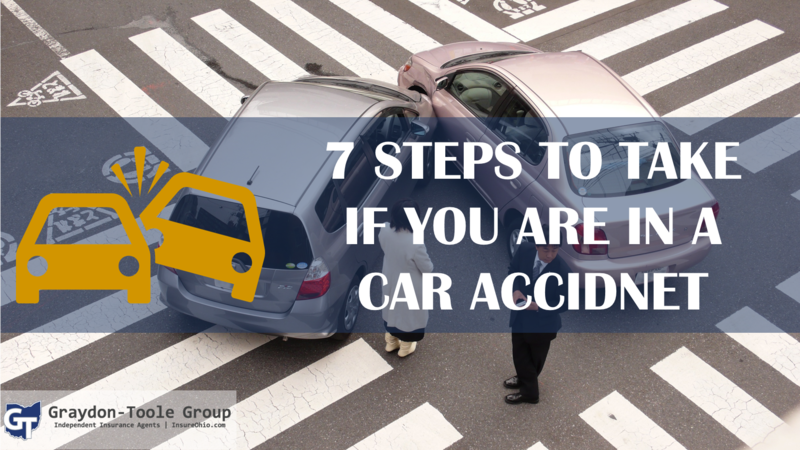 Make sure all parties involved in the accident are safe and not in any life-threatening situations. In the case of a serious injury, call 911 immediately. No one needs to be a ‘hero’ and anyone who is suffering from dizziness or related ailments should be inspected by a medical professional. Even with minor incidents, a police report can be vital when dealing with you car insurance company and other drivers involved. Cooperate fully and respectfully, but it is advised that you avoid admitting fault or blaming other while on the scene of the crash. This is where the police officer can objectively judge who, if anyone, is at fault (or responsible) for the crash. If the police can't make it (which is more likely if there are no injuries), you can file an accident report through your state's DMV. With your phone or a camera, snap photos of the scene of accident. This will be valuable when it comes to the claims process. Call your agent! If you are one of our clients, call us at 440-349-3670. If it is after business hours, all of our insurance providers have an after-hours claims line as well to take your call. You can find these links on our ‘Our Comopanies’ page.